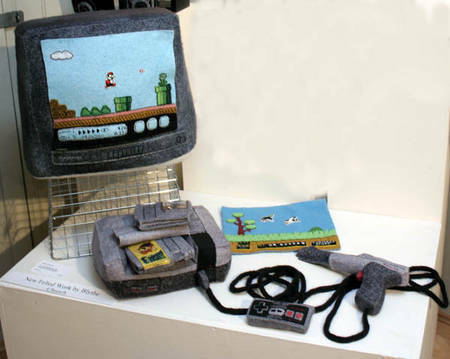 Jeff (from The Orange Belt forums) pointed out this nifty little piece of gamercraft via Craftster: a sewn Nintendo Entertainment System! The attention to detail is commendable, though I’d really like to know how big the system is. It’s hard to tell with felted crafts sometimes, especially when there’s nothing in the photos to use as a frame of reference. Of course, this doesn’t diminish the project’s awesomeness in the slightest. Make sure you check out the rest of the photos in the Craftster thread, it really is a wonderful piece.